Was the tomb empty? Would it matter if Jesus had been cremated? Is God a figment of our imagination – a social construction projected onto a cosmic screen? Can someone be a man and God? Trevor Williams wrestles with these and many other challenging questions. His aim is not simply to defend traditional Christian beliefs, but by critical analysis to expose and remove unnecessary obstacles to belief. At issue here is not only the content but the language of doctrine, and the place of myth and symbol within it. While sharing the reservations of many atheists and secularists, he argues that commitment to the ultimacy of Jesus can still be justified in our scientific age and in the context of religious and cultural pluralism, without the sacrifice of intellectual integrity or lapsing into Fundamentalism or provoking conflict. If you’re looking for creative insights and theological excitement, read this book! Keith Ward, Regius Professor of Theology (emeritus),University of Oxford. 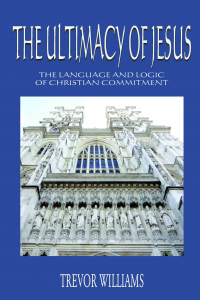 “In this clear and well-argued collection Trevor Williams offers a thorough analysis of a wide variety of theological topics which are united in their approach to the ultimacy of Jesus Christ. Based on the author’s long experience of teaching theology, the essays are enjoyable, thought-provoking and deeply rooted in Scripture and Tradition. Nobody can fail to be stimulated and challenged by this book.” Mark D. Chapman, Reader in Modern Theology, University of Oxford. Trevor Williams was born in 1938 in Uganda where his parents were CMS missionaries. After schooling in England, he did his National Service in the RAF before going up to Jesus College, Oxford, to read Theology (in which he gained a double first). He then returned to Uganda on a Goldsmiths Studentship to undertake an MA in African Studies at Makerere University. Ordination training followed at Westcott House, Cambridge. After a curacy at St Paul’s, Clifton, he was appointed Chaplain Fellow at Trinity College Oxford, a post he held till retirement.